A classic 3-reel, nickel slot game, Pharaoh's Gold truly offers you the riches of an Egyptian Pharaoh. The lowest bet is just $0.05 and the max you can bet is just $0.15. You'll love this fun and playful slot game for its cute sound effects and animation, placed on ancient Egypt. The chips denominations are $5.00, $25.00, and $100.00 and you will see these chips displayed at the bottom of the slot machine for you to click on. You can cash out whenever you want and any of the unplayed money is returned to you. Once you have a chip, you can place your bet! Click on the "Bet One" button to start playing. To pull the lever, just click on the button that says "Spin Reel". Want to Be as Rich as a Pharaoh? Play Now and give it a try! Travel back in time into ancient Egypt in search for fun and Pharaoh's own gold! Pharaoh's Gold is an action packed three reel slot machine filled with special payouts and lots of fun. Pharaoh's Gold offers a Progressive Jackpot which can be won by getting thee Mask symbols to appear on the third payline. 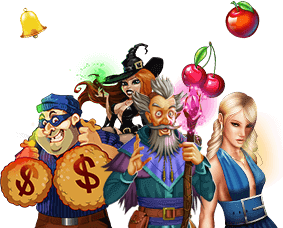 Check out our casino bonus codes. Pharaoh's Gold is a three reel slot machine played with 3 paylines. The goal of Pharaoh's Gold is to line up matching symbols on the payline. To get started choose your betting bet amount from $.05 to $5. You can play with one, two and even three credits at a time. If you wish to play with one or two credits press the Bet One button once or two times respectively and then press the Spin Reel button. If you want to play with three credits at a time, simply press "Play 3 Credits". You can practice this and many other free slot games without any restrictions at our Instant Play section. Set a bankroll and do not exceed once you have played it all. Know your wild symbols. In Pharaoh's Gold the Eye of Horus will serve as the wild symbol substituting for any other symbol in a winning combination.